Sometimes life hands you a gift…. for me, this is one of those times. This will soon appear on Jaden Hair’s fabulous blog, Steamy Kitchen as a guest post. I am so honored, thank you, Jaden! In case you don’t know Jaden (and I find that hard to believe), she is the uber talented and gifted publisher of Steamy Kitchen, New Asian Cuisine & Food Blog Forum. She has a weekly column in Discovery Health, TLC and Tampa Tribune Newspaper. She appears as a chef on the Daytime Show and she has written the fabulous, Steamy Kitchen Cookbook. I first met Jaden at Food Blog Forum Orlando in April. She also was a speaker at BlogHerFood Atlanta this past weekend. How does she do it all? I’m beginning to wonder if she ever sleeps! Oh, and she’s as beautiful outside as she is inside….she’s one very special, generous person. I’d like to take another opportunity to let you know who I am and why I have this blog. I’m Susie Kauck, and I started my blog, Return to Sunday Supper, because I want to emphasize the need for a significant, celebrated, face-to-face meal shared by family and friends at least once a week. What better way to add value to our lives than to join together around a weekly meal that brings family and friends closer? I think of this gathering as an antidote to “life as usual” – hectic schedules, physical and emotional distance between us, reliance on fast food and addiction to TV and computer screens. Return to Sunday Supper also presents nutritional information for some of the foods featured and documented reasons why it is so important for families to eat together. My blog features family favorite classics and updated recipes each tied to a personal story. I invite you to share your Sunday supper stories, best meal memories, and recipes so that together we can motivate others to start their own Sunday supper traditions. If you would like to participate, please contact me, susie@returntosundaysupper.com. This week I have been thinking about the simple pleasures of the bounty of spring and that inspired this lovely salad. It’s simple, beautiful, and easy to prepare. I think that I love carrots because I can vividly remember the charming illustrations of carrots in the Beatrix Potter stories from when I was a child. My favorite way to eat them them then and now was raw….just like Peter! Of course, if you eat them uncooked they retain all of their wonderful nutrients…just one more reason to love this salad. For this salad you can use a mandoline slicer or a grater (manual or food processor). 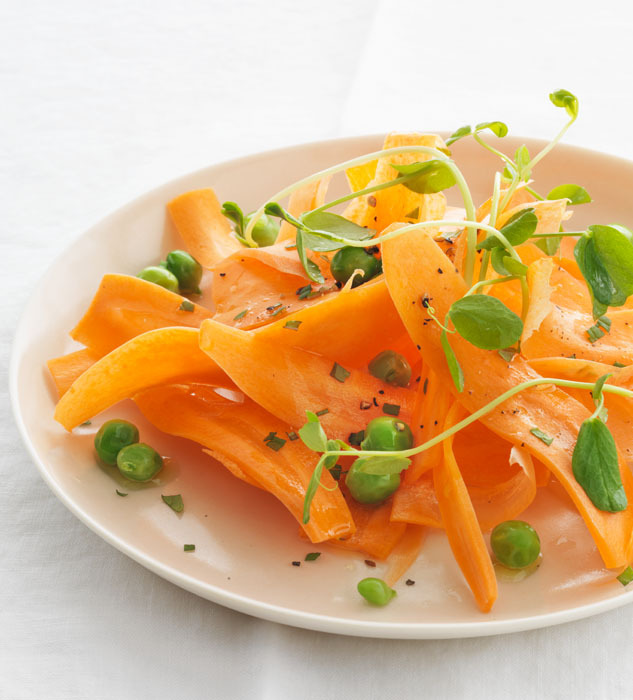 Slice carrots lengthwise using a mandoline slicer or grate them. Keep them in a bowl of ice water and drain them before assembling salad. Blanch fresh peas in boiling water for 2 minutes. 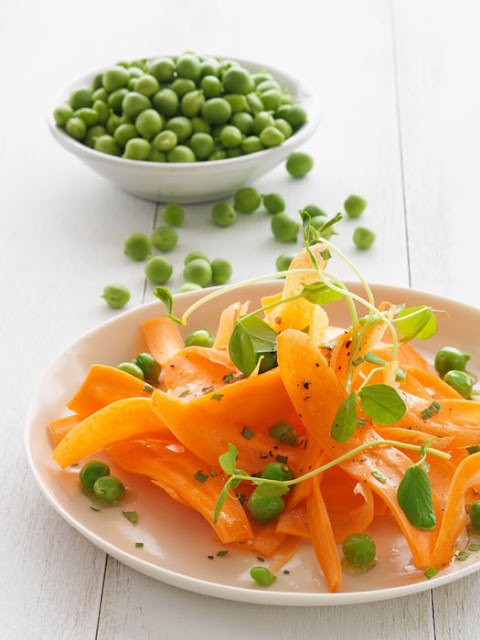 Drain and immediately immerse peas in ice water for two minutes to stop the cooking process, then drain. If using frozen peas, you can just defrost them. Arrange carrots on individual salad plates. Top with peas. Right before serving, sprinkle with chopped mint. Crush 3 sprigs of mint and add to the olive or grape seed oil. Leave the mint in the oil for for 10 minutes then remove the mint. 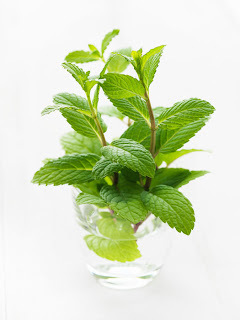 You will now have mint infused oil. Zest the lemon first, then squeeze to render 1 teaspoon zest and 2 tablespoons juice. In bowl whisk together oil, lemon juice, zest, honey (optional), salt and pepper. Drizzle dressing over salad, garnish with pea shoots if you like, and serve immediately. Susie! What a wonderful blog! I love your photographs – and your carrots! I hope that I do see you in New Orleans in August. We are enjoying our Sunday Supper after that marvelous week-end in Atlanta. What an inspiration your site will be for next week! Susie, it was so nice to meet you in Atlanta! Your photos are gorgeous – such an inspiring recipe for Spring – simple, fresh and healthy! Looking forward to seeing what else you cook up for Sunday Suppers! Beautiful photos. You and I share the same food philosophy. My blog is centered around the grace of sharing a meal. I am glad I came across your blog. I love dishes like this in spring and summer – so light and flavorful! It was great to meet you at BHFood! Whenever I hear salad the first and foremost thing that comes into my mind is the Avocado Crab and Mango salad that I had during my last kiddie party….It was really an awesome luscious salad ideal for dinner night parties…..